You think of Sicily and highlights from The Godfather immediately come to mind. While there is more to Sicily than the movie scenes, you will find that much of the charm and old-world allure of traditional Sicily still exists today. 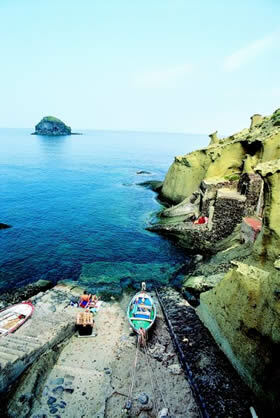 Sicily, the largest Mediterranean island, is a mix of old and new, modern and folk, beauty and ruggedness. The underlying current of mystique and legend makes it all the more attractive to the visitor. 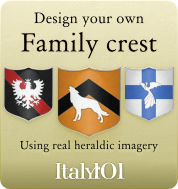 Though located just 3 km southwest of mainland Italy, Sicily maintains a unique identity. No trip to Italy is really complete without experiencing Sicily. A quick ferry ride across the Strait of Messina gets you there. Palermo, the capital of Sicily, can make a suitable jumping off point for your excursions around the eastern portion of the region, but despite the hustle and bustle of the capital, there is less to do and see for the traveler. In between your day trips to nearby cities and villages, you’ll not want to miss the opportunity to delight your senses at the Mercato Vucciria, Palermo’s central market. Mt.Etna, Sicily’s volcano and one of the most active worldwide, remains a treasured box to check on the traveler’s itinerary. 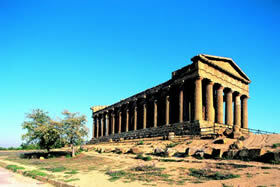 Though it may seem touristy, if you’re in Sicily, don’t miss the opportunity to visit this site at least once. From Taormina you can rent a guide or join a tour. You also have the opportunity to explore individually on foot if you like. While the beaches are a warm-weather attraction, visiting Sicily during the fall and winter months allows ample time to experience the culture, cuisine, and history of the island. Several festivals and feast days contribute to the excitement of the colder months such as Agrigento’s Apple Blossom Festival in February. Flowers are celebrated in Noto in the month of May, and Chocobarocco, a wildly popular international chocolate festival takes place in November in the town of Modica. And as always, anywhere Italy has a coastline, there will be well filled beaches. Sicily is no exception, so if you’re looking to make sunbathing a part of your Sicilian travel itinerary, you have plenty of options. For insider locales, away from the tourist crowd, check out small, charming fishing villages like Terrasini or Castellammare del Golfo. Puppetry and marionette theatre is a long-held tradition and art in Sicily. UNESCO defines this aspect of Sicilian culture as a “masterpiece of the oral intangible heritage of humanity.” The elaborately decorated puppets are employed in the acting out of stories and tales of traditional Sicilian folklore, knighthood, and comedy. Puppet opera theatres and museums are found in Palermo, Catania, Messina, and Siracusa, as well as their surrounding provinces. Check theatres for performance times. Many parts of Sicily still hold to the traditional daily schedule with long lunch breaks and shop closings during the afternoon. When in Sicily, do as the Sicilians do and indulge in a long, relaxed lunch rather than a panino on the go. Spend the quiet afternoon strolling, or even napping, to get ready to enjoy Sicily by lamplight. Sicily’s fertile volcanic land translates into a rich cuisine bearing the influence of its ancient inhabitants. From the ancient Greeks, Sicily derived a variety of flatbreads and the Muscat (Moscato) grape. Arabic influence is seen in the range of spices used to flavor Sicilian dishes and in their innumerable varieties of sweet treats. In addition to an abundance of fresh fruits and vegetables—even some rarer species like the blood orange and prickly pear—Sicilians love their sardines and anchovies. Sample the regional favorite, pasta con le sarde, which features sardines and wild fennel. Eggplants and peppers are also featured in many Sicilian sauces and dishes. Sicily lays claim to being the home of the meatball—though the meatballs are typically served in a sauce without pasta. The Pecorino Siciliano, Ragusano, and Ricotta are the shining stars of the cheese plate. And you are guaranteed to encounter pasta shapes and creations you’ve never seen before. But don’t fill up on too much of your main course—Sicily is known as the “treasure island of sweets”—be sure to save room for dessert! Marzipan, pistachio-based ice cream and cannoli are dishes that Sicilians claim to have created and they take them seriously. 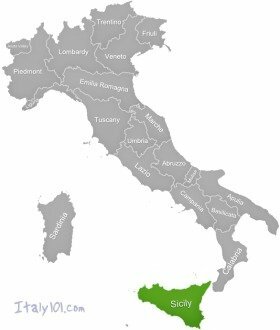 Sicily is also a major wine producer, boasting more land devoted to grape cultivation than any other region of Italy. For decades and longer, Marsala and other sweet wines have been their calling card, but Sicily also has a wide range of fine reds, whites, and rosés for the table. When dining at a family-owned trattoria, ask to try the local favorites to get the most authentic experience. To access the island, an option is to fly into one of Sicily’s airports—either Falcone-Borsellino Airport in Palermo (if you plan to explore the west) or Catania’s Fontana Rossa Airport (if you will begin your trip in the east). Ferries can be taken from Italy or any of the nearby islands such as Sardinia or Corsica. If coming from the Italian mainland, take a ferry or hydrofoil departing from Reggio di Calabria or Villa San Giovanni and arriving in Messina. You may also use the ferry if planning to bring a rental car across. 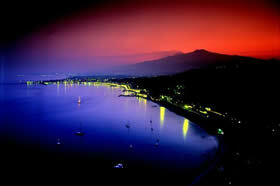 Etna - The majestic presence of Europe's biggest active volcano makes for unforgettable sunsets. 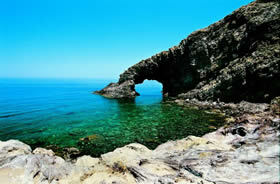 Pantelleria - Can you see an elephant lying down with its trunk in the water? That's why they call it Elephant Bay. Salina - The little port of Pollara, so evocative and isolated that it has been chosen as the set for numerous films. 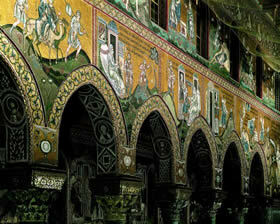 Sicily, Monreale - Scenes from the Bible in the dazzling gilded mosaics of the Cathedral. The Temple of Concord dominates the entire Valley of the Temples.